On this page, we will learn Spring MVC Validator with @InitBinder and WebDataBinder. Validator is a spring interface using which we create our custom validators. WebDataBinder binds custom validators. To do this, we create a method in controller and annotate it with @InitBinder which plays the role to identify WebDataBinder method in our controller. registerCustomEditor() is a method of WebDataBinder which configures PropertyEditor like CustomDateEditor. CustomDateEditor binds the date web request parameter to attribute in JavaBean. 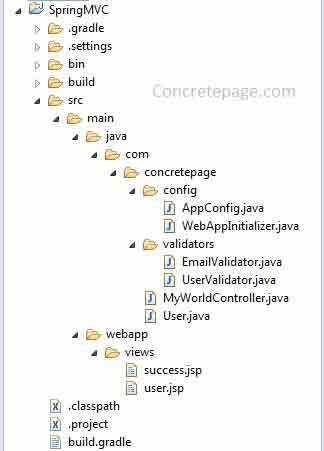 Here in our example we are creating a JavaBean with username, password, email and date of birth of a user. For the demo we are creating two custom validator classes. In first one, we will validate username and password. The second validator will validate email of the user. Now find the complete example. Before starting the demo, we should see what are the classes we are using in our demo and how they are kept in eclipse. We can download the complete source code by the link given at the bottom. Find the project structure in eclipse. boolean supports(Class<?> clazz) : Checks whether the instance of class passed as argument can be validated or not. void validate(Object target, Errors errors) : If supports() method returns true, then the target object is validated. Errors.rejectValue() method registers the error message with a field name. To create our Validator class, we need to implement spring Validator interface and define the validations as required. Find the validator classes being used in our demo. @InitBinder palys the role to identify the methods which initialize the WebDataBinder. The @InitBinder method supports many arguments as by @RequestMapping methods. @InitBinder method does not support command or form arguments. Mostly used argument is WebDataBinder in @InitBinder method. org.springframework.web.bind.WebDataBinder is a DataBinder that binds request parameter to JavaBean objects. It provides methods to assign our validator classes. Using addValidators() and setValidator() methods, we can assign our validators instances. registerCustomEditor() is a method of WebDataBinder using which we configure custom PropertyEditor for the given type and property. CustomDateEditor is a PropertyEditor which we are using in our demo. CustomDateEditor binds the date value from web request to a JavaBean Date property for a given date format. Find the code snippet. We write the above code in controller. Find the controller and view. To check the output, deploy the code in tomcat 8 and run the URL. After submitting, we will get the validation failure.